You can simply sweep, scrub, or hose the composite decking to clean it. Make sure that there is enough distance between the nozzle and SAiGE Longlife decking. Remember to spray in the direction of the grain to avoid damage. 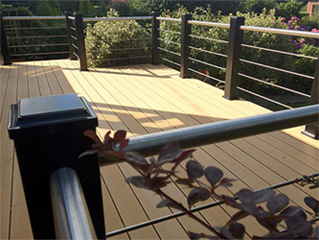 Just as with wood, SAiGE Longlife Decking’s appearance can get compromised by stubborn stains and scratches. If it comes in contact with oil or any greasy material, make sure that you remove the oil as soon as possible and clean it with a degreasing agent. When oil has set into the composite deck, use fine sandpaper or wire brush to take care of the stain (you can contact us to know the best material to use to get rid of it). If the composite decking comes in contact with rust, you can use water, soap, and a scouring pad to remove the stain. A cleanser containing lemon acid is the best remedy to heavy rust stains. On the other hand, wine and fruit stains can be removed with a cleaning agent and water while you can get rid of heavy stains with light bleach and water. Finally for light scratches, smooth out the composite decking along the grain using fine sandpaper then brush finish it with a small wire brush.